Wash the leaves several times to make sure they are all clean. Remove the center stalks from the leaves and cut the large leaves into three triangular pieces. Cut the smaller leaves into two pieces. Take the collard greens in a pot and boil for 2 minutes in salty water. Then, drain and let them cool for a while. Combine all the other ingredients, but the water in a big bowl. Take one piece of leave and place one Tbsp of filling on the larger side. 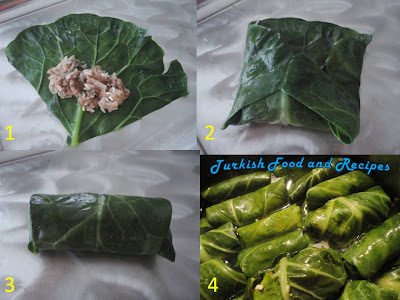 Then, fold the sides inside and roll it as seen in the picture. Repeat the same procedure for all off the pieces. Place all the rolls side-by-side in a large pot. Add hot water just to cover the rolls. Bring to a boil over medium heat. Then, turn the heat down and cover the lid. Simmer for about 40 minutes or until the rolls are tender. Serve it warm preferably with yogurt or cacik. Lahana yapraklarini iyice yikayin. Ortadaki kalin kismini kesip atin. Buyuk yapraklari uce, kucukleri iki esit parcaya bolun. Tuzlu su dolu tencerede yapraklari 2 dakika kadar kaynatin. Suyunu suzun ve sogumaya birakin. Diger geri kalan butun malzemeleri buyuk bir kaba alin ve iyice karistirin. Bir parca lahana yapragi alin ve genis kismina 1 yemek kasigi ic malzeme koyun. Yanlarindan ice dogru katlayin ve resimde goruldugu gibi sarma seklinde sarin. Diger lahana yapraklarini da ayni sekilde sarin. Sarmalari genis bir tencereye yan yana dizin. Uzerlerini kapatacak kadar sicak su ilave edin. Orta atese alin ve kaynadiktan sonra altini kisip kapagini kapatin. Yaklasik 40 dakika ya da pirincler pisene dek pisirin. Tercihen yogurt ya da cacik ile servis yapin. Wow these are great. 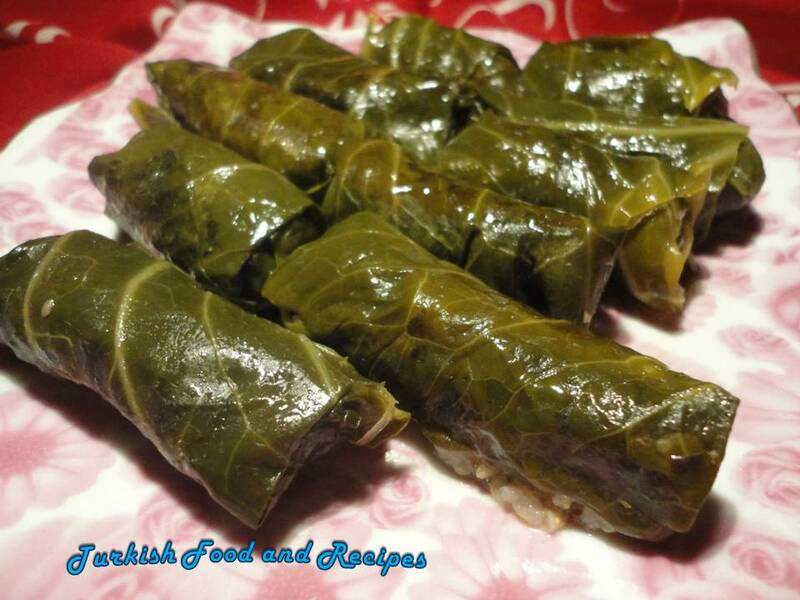 Usually I make with grape leaves, but I like this idea better. Is the rice supposed to be cooked before you put it inside the rolls? No, you don't need to cook the rice before. It will be cooked inside the rolls.